An infusion of the inner green bark in wine, or the expressed juice of the berries in the dose of half an ounce or an ounce, purges moderately, and in small doses it proves an efficacious deobstruent, promoting all the fluid secretions. The juice boiled in sugar till it is stiff, is a useful opening medicine; it promotes the natural evacuations; and, if continued for a sufficient length of time, is of considerable use in various chronical disorders. The young leaf-buds are strongly purgative, and require caution. The flowers are different in quality; have an agreeable aromatic flavour. They are made into an ointment, by boiling them in lard till they are almost crisp, and then pouring it off; this is very cooling. 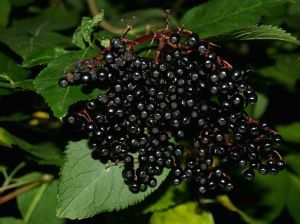 The juice of the elder berries boiled down with a little sugar to the consistence of honey is good for colds and sore throats. A decoction of the bark or berries, is successfully given in dropsy. A decoction of the middle or inward bark is more powerful. The juice of the leaves is good for inflammation of the eyes. Elder Wine is an excellent beverage for sore throats, colds, etcetera., as it is a powerful promoter of perspiration. Ebulus is very much like the Elder-tree; but growing lower, and being more of a herbaceous nature. It is wild in England, but not so common. It is more powerful than the Common Elder, as a purgative, an expectorant, a diuretic, and sudorific. Dr. Butler states it to be an efficacious remedy for dropsy�made into a decoction by water or wine. This and the other Elder are said to turn the hair black.